This report is part of a wider research into the potential of the digital economy in Central and Eastern Europe (CEE). Using new research of their own and an examination of published sources, McKinsey defines the economic potential from accelerated digitization in ten countries in the region. These countries are considered “Digital Challengers,” as they demonstrate strong potential for growth in the “digital economy”. The report analyses the key enablers of digitalization in these countries focusing on selected areas of CEE digital ecosystem. 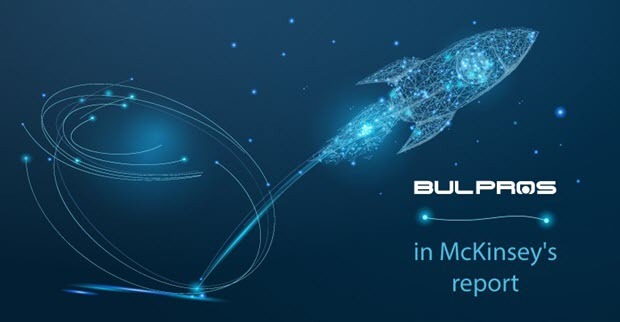 In this connection, McKinsey gives BULPROS as a good example of a CEE-based software development company, which has become a trusted partner for the digital journey and is “ranked among the fastest-growing companies in Europe”. “We are honored to receive recognition from one of the top consulting firms in the world, McKinsey&Company. For us this is another clear indication that BULPROS is going in the right direction supporting companies in their digital transformation with innovative solutions, services and products..”, commented Ivaylo Slavov, CEO of BULPROS. BULPROS recalls that in the last few years the company has been repeatedly recognized as one of the fastest growing technology companies in the Deloitte “Technology Fast 50 in CE” and “Technology Fast 500 in Europe, Middle East, and Africa” rankings as well as other prestigious reports such as Inc. 5000 Europe and Financial Times 1000 Europe. BULPROS’ mission is to empower businesses in their successful digital journey and help them embrace new opportunities. The company has established successful customer and partner relations with many companies and operates on a global level. Currently BULPROS has 18 offices in Europe and North America, and is planning to further grow its business in both continents with focus on USA and UK. Another priority for BULPROS is the international business expansion on new markets such as Asia. McKinsey&Company is a global management consulting firm that serves a broad mix of private, public, and social sector institutions. Within its 90-year history the company has become the trusted advisor and counselor to many of the world’s most influential businesses and institutions. Currently McKinsey has offices in more than 120 cities in over 60 countries. McKinsey conducts qualitative and quantitative analysis to evaluate management decisions across public and private sectors. It publishes the McKinsey Quarterly since 1964, funds the McKinsey Global Institute research organization, publishes reports on management topics, and has authored many influential books on management.